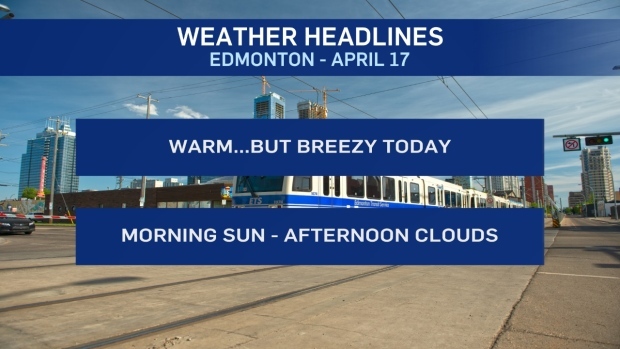 Sunny skies in the Edmonton region this morning will give way to some afternoon clouds. Temperatures stay on the warm side with an afternoon high in the mid teens. BUT...windy this afternoon. 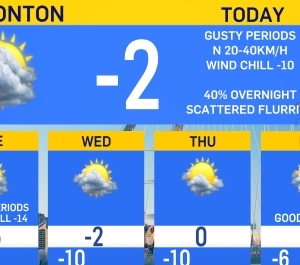 15-30km/h wind in and around Edmonton. Windier across northern Alberta with gusts in the 60-70km/h range. NE Alberta has some scattered showers this morning and we will likely get some more showers and thunderstorms in Eastern Alberta this afternoon. There might be one or two pop-up showers around or near Edmonton this afternoon. Most of the area will likely stay dry though. Warmest day this week is Thursday - temperatures in the mid to upper teens tomorrow afternoon. THEN...a bit of a cooldown for Fri/Sat/Sun. Friday has a chance of showers and we've taken the risk of rain OUT of the Edmonton forecast for Saturday. Looks like we'll have some sun for the Easter weekend. Today - Sunny this morning. Mix of sun & cloud this afternoon. Risk of a scattered shower in parts of the Edmonton Metro Region this afternoon. Wind picking up this afternoon: 15-30 km/h. Thursday - Partly cloudy in the morning. Cloudy in the afternoon. Friday - Mostly cloudy. 40% chance of showers. Saturday - Mix of sun & cloud. Monday - Partly cloudy. 30% chance of evening showers.